Tesla on Tuesday reported a year-over-year uptick in vehicle production but still fell short of its weekly goals. The company also pledged that it won’t need to raise capital for the rest of the year. Shares of Tesla spiked as much as 6% in early trading after the report. You can watch Tesla trade in real-time here. Shares of Tesla spiked as much as 6.5% Tuesday after the company reported a 40% increase in Model 3 production numbers for the first quarter of 2018 compared to the previous year. The company also said it won’t need to raise more funds this year by selling stock or issuing debt, addressing concerns about its cash balance head on. For the first four months of 2018, Tesla made a 34,494 vehicles in total, it said Tuesday, 9,766 of which were Model 3 sedans. Tesla still fell short of its goal of 2,500 Model 3s per week by the end of the quarter. It hopes to hit 5,000 per week in the second quarter. 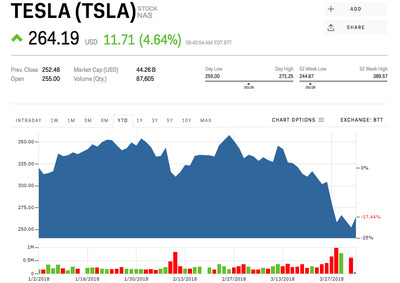 Tuesday’s gains are a much-needed relief for Tesla, whose shares have declined by 30% since late February amid plunging bond prices, ongoing reports of Model 3 production problems, and a fatal autopilot crash in California which sparked an NTSB investigation. Shares of the company are down 17% since the beginning of 2018.